21/04/15 -- Soycomplex: Beans extended the recent rally, helped by a 7-week high weekly soybean export sales total. That was 747,418 MT for both old and new crop. That included 407,700 MT for 2015/16. Exports of 339,900 MT were up 2 percent from the previous week, but down 16 percent from the prior 4-week average. Chinese soybean imports in March were up 36% from March 2015 at 6.1 MMT. January to March imports were up 4%. The Buenos Aires Grains Exchange slashed its Argentine soybean production estimate for 2015/16 to 56 MMT from its previous forecast of 60 MMT to damage from the recent excessive rains. The Arg Ag Ministry cut to 57.6 MMT from its previous estimate of 60.9 MMT. The USDA are at 59 MMT currently. 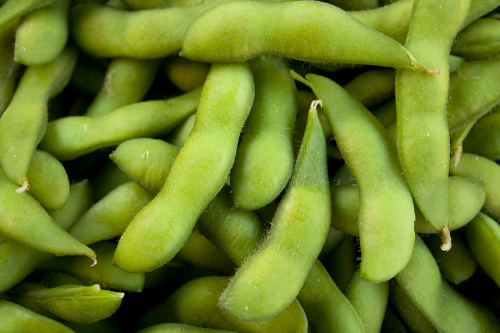 May 16 Soybeans settled at $10.18 3/4, up 9 cents; Jul 16 Soybeans settled at $10.27 1/2, up 8 1/2 cents; May 16 Soybean Meal settled at $325.20, up $6.30; May 16 Soybean Oil settled at 34.21, down 43 points. Corn: The corn market closed around 10 cents lower, despite weekly export sales of 1,202,800 MT for 2015/16 being up 6 percent from the previous week and 31 percent from the prior 4-week average. Net sales of 123,100 MT were also reported for new crop. In addition exports themselves were 1,283,500 MT - marketing-year-high - and were up 27 percent from the previous week and 20 percent from the prior 4-week average. The primary destinations were Japan (398,200 MT), Colombia (313,900 MT) Mexico (279,900 MT). There were no sales to Brazil yet, but these might not be far away. Private exporters also reported that 240,000 MT of additional US corn was sold to Japan this morning under the daily reporting system. NYMEX Crude set a near 6-month closing high. With all that bullish news it was interesting to see corn end 10 cents lower then. May 16 Corn settled at $3.84 1/2, down 10 1/4 cents; Jul 16 Corn settled at $3.89 3/4, down 10 cents. 21/04/16 -- EU grains mixed, with front month May 16 London wheat up GBP1.10/tonne at GBP107.50/tonne, May 16 Paris wheat was EUR1.50/tonne lower at EUR153.25/tonne, June corn fell EUR0.75/tonne to EUR163.00/tonne and rapeseed closed a euro higher at EUR380.25/tonne. Brussels confirmed 712 000 MT of soft wheat and 137 000 MT of barley export licences this past week. Wheat exports thus were up 34% on a week ago. 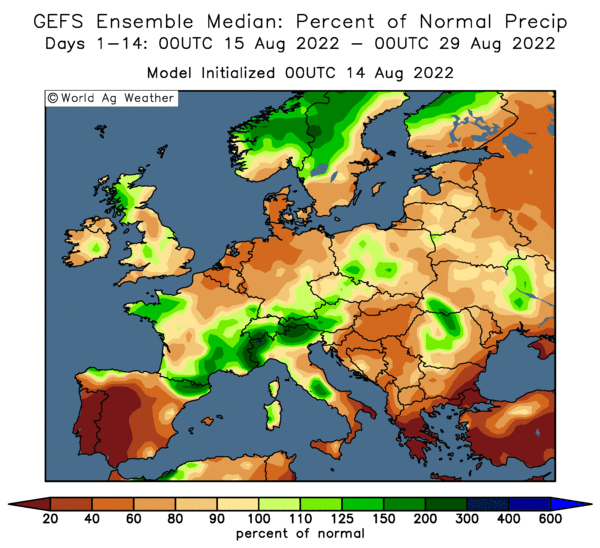 Wheat crops across most of Europe are developing well, and another bumper production year is expected, if not quit matching last year's dizzy heights. "Poland is the main problem area but otherwise the picture is broadly looking good," a German analyst told Reuters. The French have planted an 80-year high record crop, and conditions there were rated almost universally good to very good as of last Monday (92%) say FranceAgriMer. A Bloomberg survey this week put the French soft wheat crop at an average of 39.4 MMT this year, down 3.9% on a year ago. With such a high proportion of the crop rated good to very good though it may be that yields outperform and production is closer to, or even exceeds, last year. The highest estimate in the survey was 41.9 MMT. A similar survey at this point last year only pegged average production at around 38.0.38.5 MMT as I recall, based on good to excellent ratings around the 91% mark. Germany's 2016 winter wheat crop will probably fall around 1.7 percent from last year's bumper harvest to 26.10 MMT. That's still above the recent 5-year average of about 25 million, Germany's farm cooperatives association estimates. 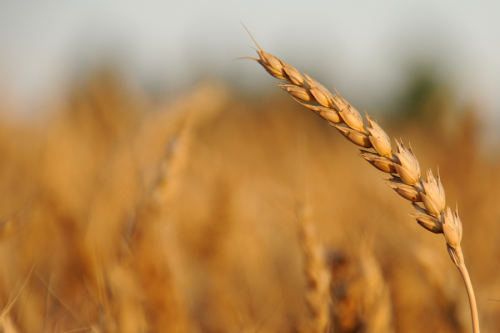 The Polish winter wheat crop could be 4% down last year, say Sparks Polska. 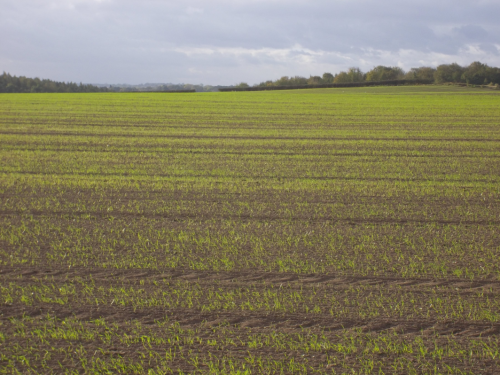 "Most of the lost winter wheat acreage will be replanted with spring wheat. Recent warm and rainy weather was more crop-friendly," they told Reuters. 20/04/16 -- EU grains closed mostly firmer, drawing good support from surging US prices in Chicago. 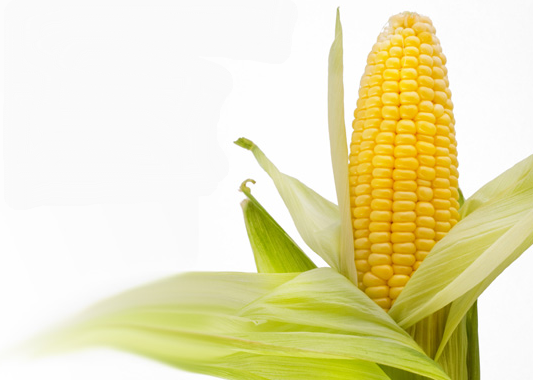 At the finish, front month May 16 London wheat was up GBP1.70/tonne at GBP107.40/tonne, May 16 Paris wheat was EUR4.75/tonne higher at EUR155.75/tonne, Jun 16 corn was up EUR4.75/tonne to EUR163.75/tonne and May 16 rapeseed jumped EUR3.00/tonne at EUR379.25tonne. This was the highest close on a front month in London wheat since late January, the best of the calendar year so far on corn and the highest since early December on rapeseed. Russian shipping data shows that their wheat exports fell last month to 1.78 MMT, down 215% versus the shorter month previously. Egypt was the largest home taking 28% of all exports, with Turkey (11%) in second and Iran (8.7%) in third. Russia's corn exports remain relatively strong by comparison, down only 2.8% versus February, and up 53% year-on-year, at 669,400 TMT. Turkey was the top buyer last month with 21.6% followed by the Netherlands with 20.7% then South Korea with 19.4%. UkrAgroConsult expects 2016/17 Ukraine wheat production to reach 19.8 MMT, up from its previous estimate of 18.5 MMT. That's falling into line with other analysts's ideas that the worst is now over for Ukraine wheat. 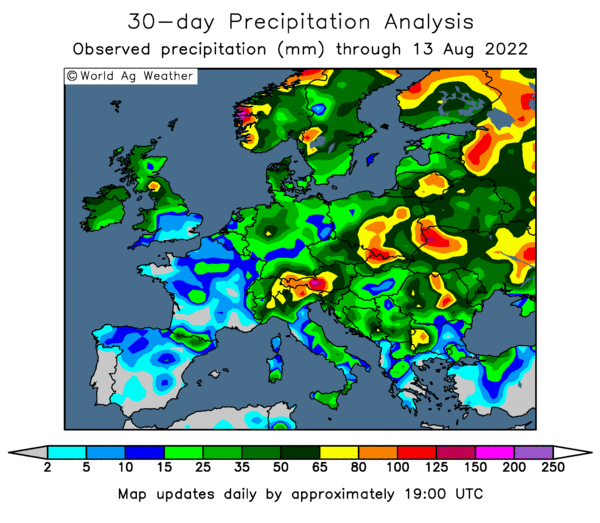 There's some talk of current low prices cutting EU corn plantings from current forecast levels. Plantings are certainly slow in with France, only 4% done versus 17% complete a year ago in last week's report from FranceAgriMer. 19/04/16 -- EU grains traded mostly firmer for a second day, with May 16 London wheat closing GBP0.55/tonne firmer at GBP105.70/tonne, May Paris wheat was EUR0.75/tonne higher at EUR151.00/tonne, June corn jumped EUR2.50/tonne to EUR159.50/tonne and rapeseed closed EUR4.75/tonne higher at EUR376.25tonne. For rapeseed this was the highest close for a front month since before Christmas helped by reasonably buoyant US soybean values, and lower anticipated EU production once again in the face of strong demand. US wheat prices are moving higher - especially so in Chicago - primarily it would seem under the enormity in size of the fund short position that has been built up in it. Russian spring grain plantings are 12.6% complete so far. That's up sharply compared to this time a year ago. Weather conditions lean favourable for the time being and prospects for 2016 production appear better than feared. The Russian Ag Ministry estimate winterkill loses at 800k ha, only half of the 1.4 million that was being suggested at the height of the winter. The 2016 Russian wheat crop is now expected to beat last year's total at around 62.3 MMT say Agritel. In Ukraine, whilst a steep decline in winter wheat is still on the cards, production estimates are nudging higher from some of those being suggested a month or two back. Europe's crop appears to be in pretty good shape too, and with bumper carryout left over from 2015/16 will be looking for every export avenue open to it. 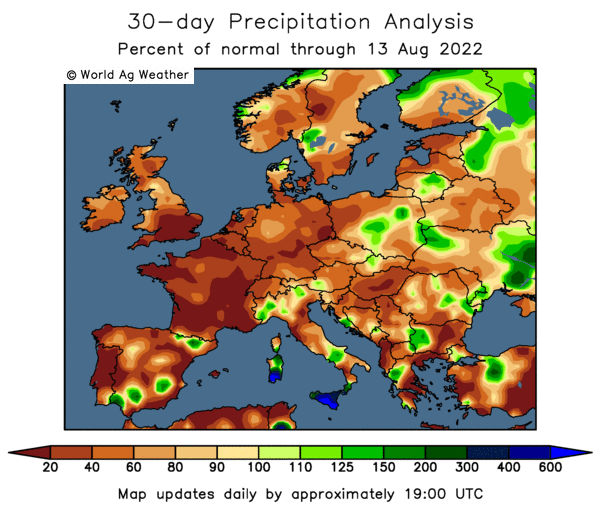 Keep an eye on North Africa then, where heat/dryness has sapped winter crops and the likes of Morocco, Algeria, Tunisia and Egypt should end up importing good volumes of EU wheat and barley again, say the HGCA. 18/04/16 -- Soycomplex: Beans closed a touch firmer, but well off earlier highs. Weekly export inspections totalled 256,822 MT. That was down 33.7% from the previous week, but up 73% compared to the same period a year ago. YTD inspections are 42.290 MMT, or 91% of the USDA's target for the season. Excessive rains in Argentina could be causing some yield issues, it is being said. In recent seasons that hasn't ultimately proved to be the case. May 16 Soybeans settled at $9.54 1/4, down 1 3/4 cents; Jul 16 Soybeans settled at $9.63, down 1 1/4 cents; May 16 Soybean Meal settled at $293.00, down $2.90; May 16 Soybean Oil settled at 33.95, up 57 points. Wheat: The wheat market finished with good gains, especially in Chicago. News Friday that fund money sits on a near record long in CBOT wheat maybe had a few lightening the load. Weekly export inspections of 456,924 MMT were 34% up on last week. YTD inspections of 17.614 MMT are now 12.9% smaller than a year ago. A Bloomberg survey forecast this year's coming EU28 soft what crop at 145.8 MMT, from within a range of 140.77-153.00 MMT, and all wheat output at 154.9 MMT, from within a range of 15.68-161.70 MMT (USDA all wheat 160.00 MMT in 2015/16). In the case of all wheat that's a 3.2% fall versus last year. The USDA put the US winter wheat crop at 57% headed, only 1 point up on the week, but still better than 42% this time last year. Spring wheat planting is seen at 27% complete versus 13% a week ago, 31% a hear ago and 19% for the 5-year average. Jul 16 CBOT Wheat settled at $4.81, up 13 1/2 cents; Jul 16 KCBT Wheat settled at $4.75 1/2, up 7 1/4 cents; Jul 16 MGEX Wheat settled at $5.32 1/2, up 4 1/2 cents. 18/04/16 -- EU grains mixed, but mostly steadier to start the new week. 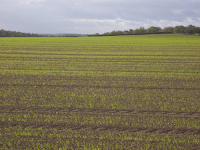 At the finish, front month May 16 London wheat was up GBP1.10/tonne at GBP105.15/tonne, May 16 Paris wheat was EUR0.25/tonne lower at EUR151.00/tonne, June corn rose EUR0.25/tonne to EUR155.75/tonne and rapeseed closed EUR3.50/tonne higher at EUR372.00/tonne. A Bloomberg survey forecast this year's coming EU28 soft what crop at 145.8 MMT, from within a range of 140.77-153.00 MMT, and all wheat output at 154.9 MMT, from within a range of 15.68-161.70 MMT (USDA all wheat 160.00 MMT in 2015/16). In the case of all wheat that's a 3.2% fall versus last year. As far as a nation-by-nation breakdown goes, the average guess for French soft wheat was 39.4 MMT, with Germany at 26.0 MMT and the UK at 15.3 MMT. There's a long way to go just yet, but for now those figures look about right, although under pressure I'd tend to favour higher numbers than lower ones right at this moment in time. 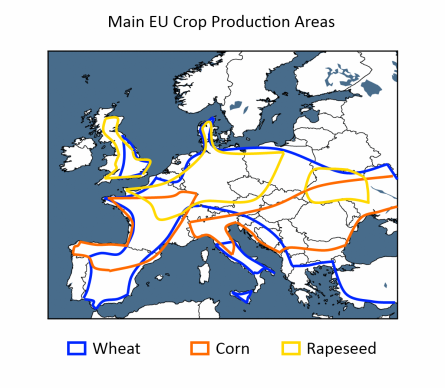 There's much debate too over crop production potential in Ukraine and Russia. Agrtel today released their latest forecasts, calling for Ukraine wheat in 2016 at 19.3 MMT, up from 17.2-18.1 MMT previously, although down 27% on a year ago. For Russia they are now predicting a wheat crop of 62.3 MMT, up from 61 MMT in 2015 from the USDA. Russian seaports shipped out 456 TMT of grains last week, including 330 TMT of wheat, 52 TMT of corn and 69 TMT of barley. Calendar year to date exports are 9.58 MMT, of which wheat accounts for 5,38 MMT. Full 2015/6 season to date exports are 32.5 MMT, of which wheat accounts for 21.44 MMT. Ukraine's seaports meanwhile shipped out 662 TMT of grain last week, including 235 TMT of wheat 425 TMT of corn and 3 TMT of barley. The picture being painted then continues to be one of another strong production year in 2016/17, output mighty be down,, but not by much. Large carryover stocks from 2015/16 still means that we will begin the new season with a larger disposable surplus than the last. 15/04/16 -- EU grains closed mostly lower, with one or two minor exceptions, and narrowly mixed for the week. The latter theme highlighting the lack of direction in the market right now. 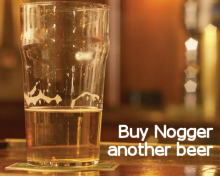 At the finish, front month May 16 London wheat was down GBP0.05/tonne at GBP104.10/tonne, May 16 Paris wheat was EUR2.50/tonne easier at EUR151.25/tonne, Jun 16 corn was up EUR0.50/tonne to EUR156.75/tonne and May 16 rapeseed fell EUR3.25/tonne at EUR368.50/tonne. For the week, that puts London wheat GBP2.10/tonne weaker, with Paris wheat shedding EUR3.00/tonne, corn gaining EUR1.75/tonne and rapeseed adding a quarter of a euro. European wheat exports have maybe fared a bit better than expected this season, although carryover volumes from 2014/15 are still high. The outlook for bumper production again in 2016/17 will likely cap gains for the time being. Thee re are legitimate concerns over the size of this year's Ukraine wheat crop due to late planting and adverts winter weather. APK Inform agency peg winter wheat sowings in Ukraine down 14%, with production of around 21.5% - down 37 compared to 2015's crop. Some of this decrease will be compensated for by increased planting and production of corn in Ukraine this year. The jury is still out on Russia, but losses are not thought likely to be so extreme. In France, winter wheat crop condition ratings were left unchanged on a week ago at 92% good to very good with 99% of the crop now displaying an ear of at least 1cm. 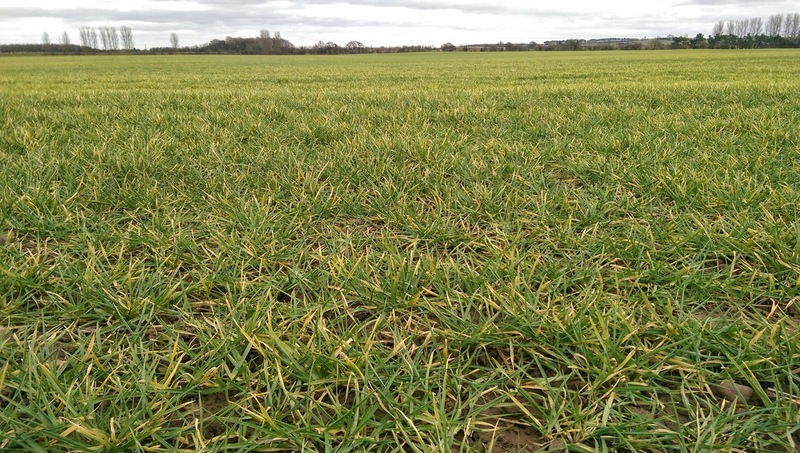 Winter barley is 91% good to very good and 92% with an ear of at least 1cm visible. Spring barley is 96% emerged. Corn planting is 4% done versus 17% complete this time last year. Demand for North Africa and elsewhere remains pretty strong, but competition for this business is usually fiercely fought over. Euro weakness is an assist in this department. The US 2016 wheat harvest will soon be upon us, and that has also escaped the worst of the winter based on current crop ratings. US growers traditionally have "longer pockets" than their FWU counterparts, the latter can't await for the market to "come to them" and must be in their pitching aggressively from Day 1.